Sandals resorts fires its CEO!! In August 2013, CEO of Sandals Resorts International Adam Stewart made a fiery challenge to Facebook fans to encourage friends and family to “like” its page in an effort to reach its goal of 250,000 likes. 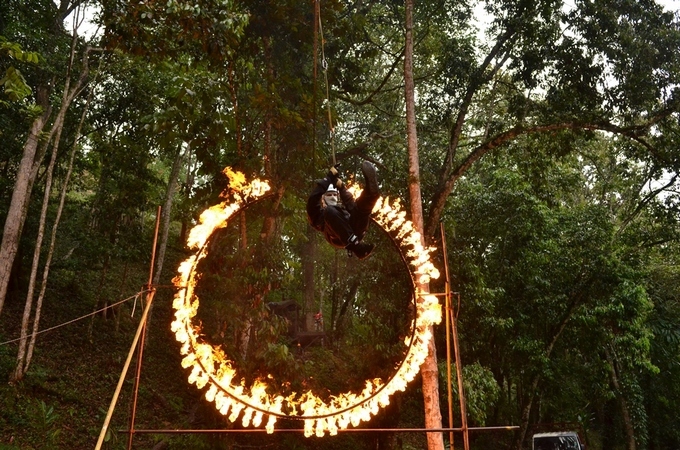 After successfully achieving this milestone in less than 2 months, 33-year old Stewart has fulfilled his outrageous pledge to zipline above the Jamaican rainforest through a ring of fire with the help of David Waine, the special effects expert behind Hollywood blockbusters Mission Impossible and hit franchise Fast and Furious. Enlisting the local support of Island Routes Caribbean Adventures and Caribbean tour operator Chukka, Stewart successfully conquered the feat relatively unscathed with his wife and children watching on anxiously as the safety team immediately extinguished Stewart’s arm and leg. The stunt has been captured in a video and is posted on the Sandals Resorts website and Facebook page for fans to view. In tandem with this campaign, Sandals Resorts also ran a sweepstakes offering Facebook fans the chance to win a four-day/three-night Luxury Included® Vacation to Sandals Resorts or Beaches Resorts. The lucky winner of this escape to paradise was announced on Facebook this week. To watch the video and to be the first to hear about all future contests, giveaways and sweepstakes, be sure to “like” the Sandals Resorts Facebook page. For more information about Sandals Resorts, visit www.sandals.com.